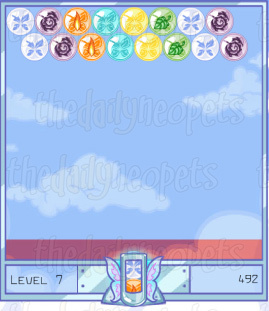 The aim of Faerie Bubbles is simple enough - clear all the bubbles before the bar pushes them to the bottom of the screen. However, the game itself requires patience, care, luck and practice. 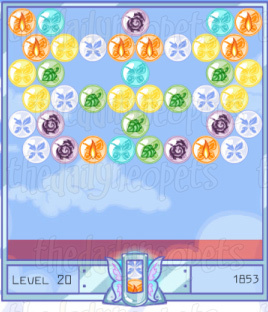 The left and right arrow keys control the bubble shooter's movement. The up arrow key makes the shooter move back to the middle, pointing straight up. When cleared in groups of three, the bubbles will simply disappear. However, when a combo - 4 or more bubbles cleared together - are formed, each type of bubble has its own special effects, both good and bad. Fire - Clears all bubbles touching it except water. Water - Clears all water bubbles on the screen. Light - Turns all bubbles touching it into the same, random, type of bubble. Earth - Adds a new line of bubbles to the top of the screen. Dark - Turns into random, different bubbles. Air - Fills the gaps of the lines they are in. Nova - Clears anything within two bubbles of what it touches. Rainbow - Turns into the colour of the first bubble it touches, or to a random bubble if it hits nothing. Use these sparingly, as they can only be used once per game. bubbles - Turns all bubbles on screen into the same, random, type, including rainbow. Only rainbow can pop them if that happens so be careful! stardust - Turns your current bubble into a Nova. slumberberry - Moves the bar back to the top. faerieland - Turns your current bubble into a Rainbow. 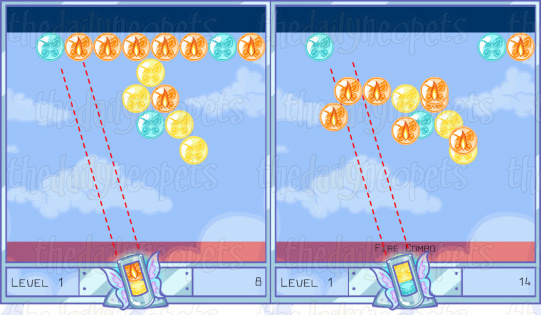 At the end of each level, you are awarded bonus points depending on how many shots you made. The less shots, the more points you get. Always remember this, because 90% of the time bonus points will give you more than making combos. A very useful strategy is the 'pile-up' technique. If you pile bubbles below each other, then clear the higher ones, all the bubbles below it will fall down - as shown in the screenie. 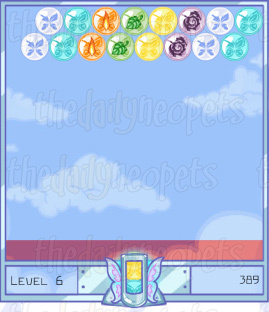 Below are the levels with the most common bubble formats. The bubbles will still sometimes differ from those in the screenies below, but the same layout will apply, so this should still give you a good idea of what to do. This is a really easy level. I recommend restarting until the top line consists of 'good' bubbles - which saves time and shots, earning you more bonus points. Clear the top, centre line of bubbles, then clear the groups of two beside it. 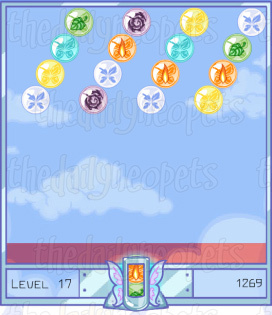 However, if you have the same water bubble layout as shown above, you'll only need one shot to form a water combo - clearing all the water bubbles from the screen. 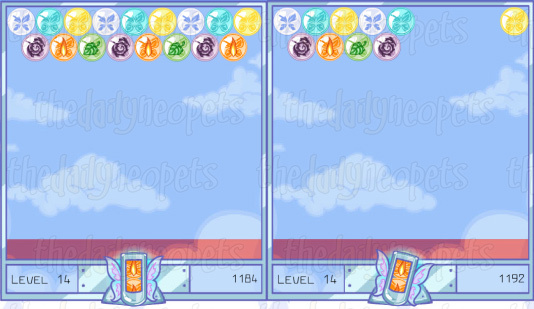 Only a few bubbles will be left, and you should be able to clear them in a few shots. Clear the groups of three on both sides, making the bubbles under them fall. 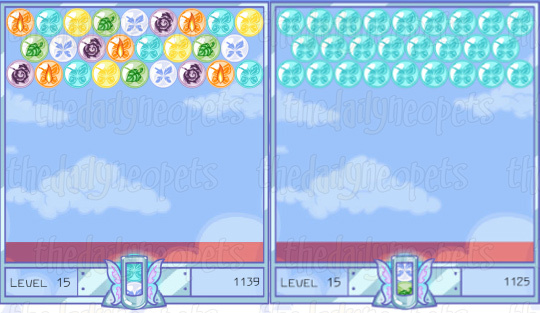 Three bubbles will be left, which can be cleared in a few shots. If you get the exact same bubbles as in the screenie, make a fire combo just under the centre group of three dark bubbles. The fire combo will clear them, leaving only two dark bubbles on either side, plus the extra air bubble. If you don't get this layout of bubbles, clear the centre three bubbles to form a combo, then clear the two extra bubbles and the two on either side. 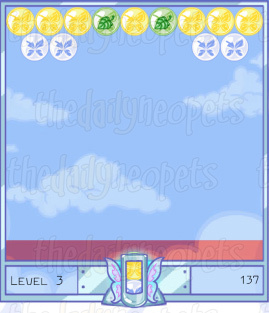 If you're lucky, this will be a very easy level. 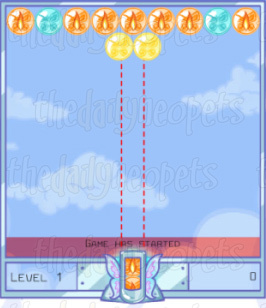 Shoot an extra fire bubble to the side of the Earth bubble, then form a combo to clear the earth bubbles. Clear the water bubbles, then the pair of light bubbles. 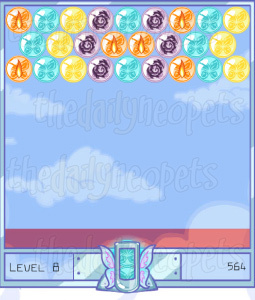 Don't make any combos in this level - just shoot off the pairs of bubbles. This level should be cleared very quickly. 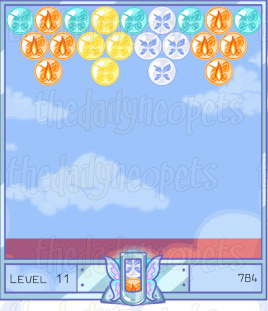 That's right - this level is basically a flipped version of the previous level. Same strategy - no combos, just clear the pairs. Clear the water combo first, then use the 'good' bubble combos to get rid of the 'bad' bubbles. This shouldn't be too hard, but you need to be careful with where you shoot, and a bit of luck may be needed as well. Be very careful with your aim in this level - if necessary, get a ruler so you'll know exactly where you're shooting. Start by clearing the lower pairs of bubbles, then work your way up to the top. 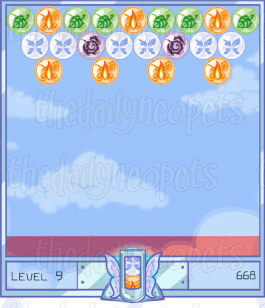 This level is, in a way, similar to Level 8. Use the 'good' bubbles to form combos and clear the 'bad' bubbles. Don't use light combos if you have fire available, since light is pretty unpredictable. Pretty similar to Level 10. If you're lucky, you'll have groups of fire or light bubbles, which you can use to clear the 'bad' bubbles. Since you'll be aiming in between bubbles, be careful of your aim, as always. This isn't as hard as it looks, fortunately. Air bubbles cover a whole line, so they'll just fall off - so don't panic if you get them. Use a 'good' combo to break into the top layer, then clear the top layer and let everything fall off beneath it. If you already have lines of good bubbles, though, you can simply set off the combos, starting from the bottom. This is almost exactly the same, apart from an extra odd bubble in the top layer, so use the same strategy. The extra bubble will probably cost a few shots, but that won't make too much of a difference. Try to save the 'stardust' code for this level - it'll make it much easier. Use it to clear around half of the side, with the shooter positioned exactly as shown in the screenie. Then start clearing away the rest. I prefer to use the bubbles - faerieland strategy here, but you can save it for later if you really want to. Type in the 'bubbles' code, hoping that it won't turn into dark bubbles. 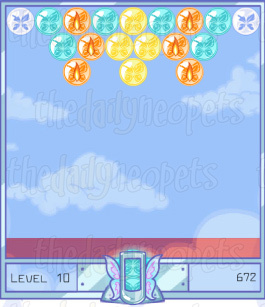 Then type in the 'faerieland' code, and you'll be able to clear the level in one shot - earning you a 250 point bonus. If you get earth bubbles, only one line will appear, and you should be able to get past that. If you get dark bubbles, set it off then use any good combos within it. 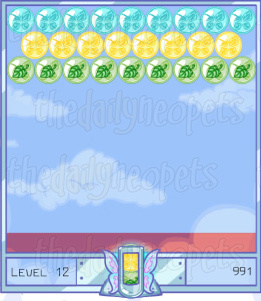 Passing the level after that is possible. Try to clear the higher up bubbles first, so that the ones underneath them can fall away. 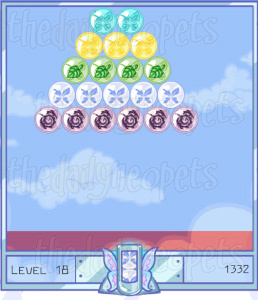 This level is pretty similar to Level 16, except a little harder. Again, be careful about where you're aiming. Shoot at the spaces between the lines, between two bubbles, hopefully clearing them. 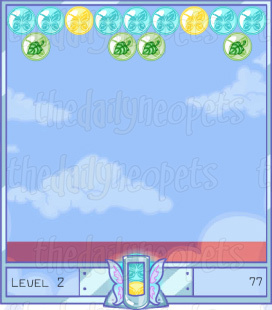 You might also need the 'slumberberry' code here, but save it for Level 19 if you can. This level is actually really easy. You need to aim at the side so the bubbles can bounce off the walls and reach the top - then, all the layers of bubbles beneath it can fall. However, you need to be really careful when aiming. 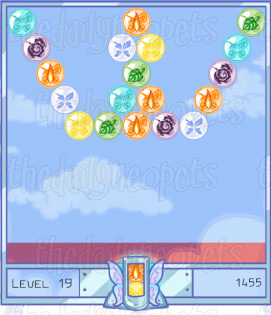 If you manage to pass this level, you get a bonus at the end of Level 20, so be very careful here. Clear the pair of bubbles in the middle, then aim for the higher bubbles at the sides. If you've still got your 'slumberberry' code, now's the time to use it. Congratulations on getting to the end! You get a 250 point bonus at the end for getting here. This is added when you finish, however, so if you lose with 1750 + points, 250 will be added, enough to get you the avatar. 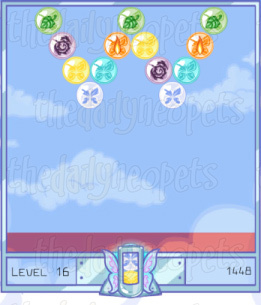 There isn't a really direct strategy for this level - clear anything within reach, try to get to the top and clear the higher bubbles so the ones below will fall off. 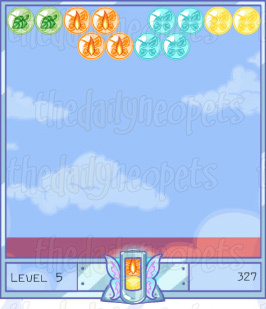 You'll still get the bonus, though, so if you have enough points don't worry too much about clearing this level. 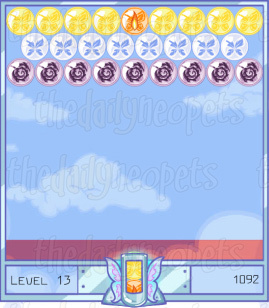 Faerie Bubbles is a pretty fun game which requires a lot of concentration. Don't worry if you haven't got enough points for the avatar the first time you reach Level 20, because now that you know how to get there, you'll eventually be able to get the avatar. Good luck! The Snowager is awake. He'll be sleeping in 6 hours, 28 minutes.